Photograph of a broken statue of the Jain Tirthankara Neminatha, from the courtyard of the Shiva Temple at Gehraho in Jhansi District. 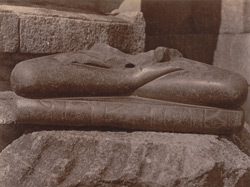 This print shows a close view of the base of the statue, showing the crossed legs of the figure. 'A broken image of Neminatha, with a record of Samvat 1228, is lying in the courtyard of this temple; originally it came from the bank of a large lake half a mile to the north of the temple.' North-Western Provinces list p. 116.